This section is intended to introduce you to a graphical environment on various Linux systems. You can use this to explore Linux installed on your own computer, or you can use it to connect to our servers graphically and use Linux here. Presently there are four different methods of connecting that provide a full remote desktop from our server like the one pictured above. 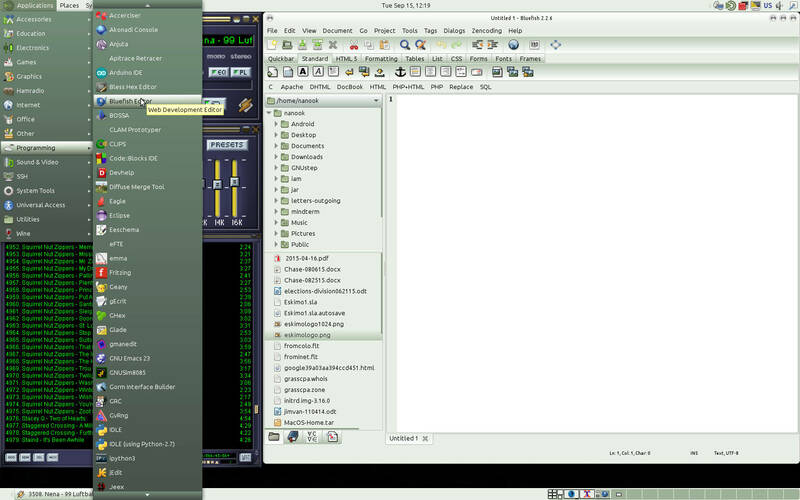 And yes, WinAmp, normally a Windows application, is running under Linux using Wine. This allows you to use your screen, keyboard, mouse, and with X2Go, speakers, printer, and USB devices, as if you were sitting in front of our server directly connected. Not all methods are supported on all servers. X2Go and NX are supported on all of our Linux based servers. X2Go provides remote X-sessions tunneled over ssh but it does far more. The X2Go protocol eliminates many of the normal X-windows round-trip delays, provides efficient compression, and provides sound, and with a little setup effort can also provide remote printing and remote access USB devices on your client computer. The X2Go client is totally free and may be obtained at http://wiki.x2go.org/doku.php/doc:installation:x2goclient. It is available for Mac, Windows, and Linux systems. Because of the way keyboard translation is handled on Mac systems, the Mac version only works if you use one of the Bourne shell derived shells such as sh, ksh, zsh, bash, or dash. For help setting up the X2Go client on your computer please see https://www.eskimo.com/support/remote-desktop/x2go/. NX protocol is an open source protocol originally developed by NoMachine. Sound does not work with any of the open source servers such as freenx and clients such as opennx. Debian based Linux distributions such as Mint and Ubuntu include a client called “remmina” with an NX plugin that works reasonably well. Also, freenx-client, if you can find it anywhere, works as well as OpenNX. The NoMachine 4.x Player will also work but connections are unreliable because it is designed for 4.x libraries. The older NoMachine 3.5 client works better but is no longer available except to paid subscribers of NoMachine. For help setting any of these up click on the blue link for the client in question. VNC is one of the earlier methods of redirecting an X-windows session to a remote computer. It provides compression as with NX and X2Go, but doesn’t do some of the things the latter protocols use to eliminate end-to-end X-window delays and so it is not as fast as the other protocols. It also does not, by default, tunnel the connection through ssh so it is normally insecure and unencrypted, but there are some newer clients such as Chicken VNC (not to be confused with Chicken of the VNC which does not tunnel over ssh) that do tunnel through ssh to provide a secure connection. VNC should be thought of as something to use if X2Go and NX are not options. RDP is available on shellx.eskimo.com. It is useful in situations where you can not install client software on a Windows computer and have to use what is provided because it is normally part of a Windows installation. It is slow, insecure, generally provides poor quality and no audio. But when you want to access a graphical application and have no other option, then it is available to use. Regardless of whether you use the Gnome or Mate desktop, you will get a Desktop resembling the image above. One very important thing to understand about Linux is that it is not a monolithic experience like Windows or Mac OS X, it is a toolbox, a giant box of Tinker Toys, absolutely nothing is set in stone, you can change virtually everything. What I am showing here is just one possible configuration which, if you use Gnome or Mate here, will be the default. But you can change your Desktop to different desktops that work quite differently, and Gnome, Mate, and many other desktops are highly configurable so that you can make them look and act almost anyway you want. With the default configuration, the top panel will contain Applications, Places, and System. This is very similar to the Start Menu on Windows but instead of a pop-up, it is three pull down menus. Applications is where you find all the normal applications you can use. On most of our servers, it will contain sub-menus of Accessories, Education, Electronics, Games, Graphics, Hamradio, Internet, Office, Other, Programming, Sound & Video, System Tools, Universal Access, Utilities, and Wine. Places will show your Home Folder, Desktop, and then Computer and Drive(s), Network and Connect to Server, Search for Files and Recent Documents. System will have Preferences, Administration, Control Center, About Mate or Gnome, Lock Screen, Logout, and Shutdown. Some of these require the root password to use. There will not be an SSH sub-menu on the shell servers unless you create one but everything else will be present on most servers. I’ve created this menu on my workstation as a quick way to get an ssh terminal to various servers. Accessories contains a lot of little accessories such as clocks, calendars, note taking applications, several dozen text editors, and various other accessory applications. There are many editors beyond what is in the Accessories that are accessible in other menus or from the command line. There is also a Files file manager there but I recommend using Caja under System Tools instead. If you hover over any menu item, it will pop up a small yellow box with a description. Education is very well populated on Ubuntu and other Debian derived systems with educational applications for children and adults alike. If you want to exercise your brain, take some time to explore this section. There will be educational applications on all of our shell servers but more on the Debian derived than the Redhat. Electronics has some nice design tools. Arduino makes it easy to write code and upload it to the Arduino micro-controller board. Eagle is a program for designing printed circuit boards. Eeschema allows you to create electronic schematics. Electric is an electrical CAD system. There are programs for ASIC design, electronic circuit simulation, and much more. Again, hover over any item for a description. Games has hundreds of games on the Debian based servers, less but still quite a lot on the older Redhat EL6 based machines, and very few on the newer Redhat EL7 based systems. There are more games than what are in this menu, particularly old BSD games are only available from the command line. Graphics contains photo manipulation programs, drawing programs, scanner programs, many other image manipulation programs. The two programs I use most frequently are Gimp to process photographs I’ve taken, and Shotwell to unload my camera. All the images used here were processed with gimp. Hamradio contains satellite trackers, ham radio examination trainers, code practice programs, antenna design and impedance calculator programs, and much more.